Music transcends language, and in the case of French singer and innovator Serge Gainsbourg, the sheer coolness of his music easily distracts us from the fact that all his songs are sung in French. Mostly covering his late 60s, early 70s heyday, this retrospective features the famous duet “Je T’Aime…Moi Non Plus” with Gainsbourg’s lover at the time Jane Birkin, as well as purring duets with lovelies like Catherine Deneuve and Brigitte Bardot. As the daughter of famed French crooner Serge Gainsbourg, one could be forgiven for thinking Charlotte Gainsbourg is riding her father’s coat tails or cashing in on a name. With two successful albums under her belt already, and the talented Beck on board for the third as producer, co-writer and collaborator, Ms. Gainsbourg is a talented artist in her own right, one who just happens to share a famous moniker. Oh and did we mention she’s an Oscar-nominated actress too? Coat tails indeed. Historical nonfiction can be a mixed bag. Dry, yet well-written and thin on fact. David Cordingly’s pirate history is a refreshing exception to the rule. Written with a storyteller’s eye for intrigue, this read is brimming with informative detail about the dastardly devils of the sea. For those of us still fascinated by Long John Silver and Captain Jack Sparrow, this treasure of a book breathes new life into the myths of our childhood imagination. 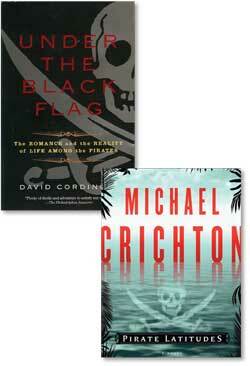 A posthumous publication, Crichton’s newest read is guaranteed to bring fans back to the fold again. Discovered as a whole manuscript after his passing, this rollicking buccaneer adventure is Crichton in his element, immersed in the literally cutthroat world of pirates at the turn of the 17th century in Port Royal, Jamaica. Robin Williams didn’t invent Flubber...Fred MacMurray did. The original Disney classic, 1961’s The Absent Minded Professor is the definition of family entertainment…a great trip down memory lane for older generations, and a fun new discovery for the young. From the same director who created gems like Mary Poppins and That Darn Cat, this flick harkens back to a time when Disney had the market cornered on good honest fun. 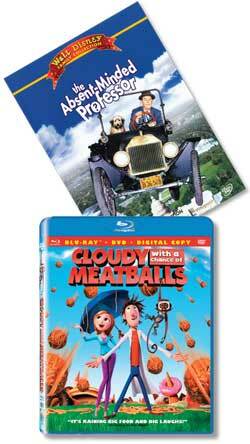 Based on the beloved children’s novel, Cloudy With A Chance of Meatballs is the modern animated answer to family favorites like Flubber and the Nutty Professor. Featuring the voices of SNL’s Bill Hader and Andy Samberg, James Caan, and Anna Faris, Cloudy will bring flurries of giggles to any family movie night.